Cold weather is approaching and I have gone beanie crazy. 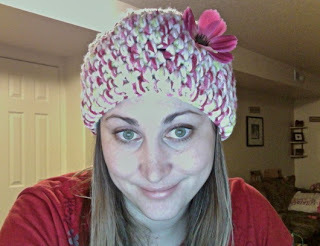 In the last week I have made a beanie for myself and each of my children. The only one left is my hubby. I'm thinking of making him a beanie with a BIG embroidered Mac symbol. Muahahaha! (There is an ongoing war in our house: Mac vs. PC. I'm a Mac, baby). Here are the results of my latest obsession. Do you think it would be too much to make one for the dog?? When I made this for Dax he yelled, "Curse you Perry the Platypus beanie!!" My girly beanie. It is puffy at the top for less "hat hair". Your hats are adorable! I can't pick a favorite! My kids would love the Jack Skellington! very nice indeed! I love the Jack Skellington one too! Super cute, my obsession is scarves. Thanks for sharing at Bacon Time. Oh very Cute Love IT! نصلك اينما كنت فى اسرع وقت وفى اى مكان نحن مكسيم اسم يعنى الثقة . عندما يتعلق الأمر بالحفاظ على منزل أنيق ومرتب، لا تجعل تجتاح ScrewYOU عليك التخلي طويلة قبل ان الوقت قد حان لفصل الربيع التنظيف. بدلا من ذلك، كسر الوادي اللعين وظيفة (غسل الملابس، تنقية الحوض) بانخفاض في الاشياء الصغيرة يمكنك المسيل للدموع هنا وهناك. وهذه التغييرات الصغيرة إلى روتينك تساعد على الحفاظ على نظافة المنزل ومنظم مع الحد الأدنى من الوقت والجهد.